SpaceX has delayed the launch of its latest Falcon 9 v1.1 rocket – tasked with lofting the ASIASAT-6 satellite into orbit – for one to two weeks. The call was made by CEO Elon Musk shortly after the rocket had been erected at her Space Launch Complex -40 (SLC-40) pad, with the rationale based on giving the team more time to evaluate any potential commonality with an incident involving a test vehicle. Initially, no specific reasons was provided as to why the call was made, although engineers had been working on a helium leak throughout the past 24 hours or so, as noted during Monday’s Launch Readiness Review (LRR) that classed this as an open item, per L2. Following the removal and replacement of two valves on Tuesday morning, engineers confirmed the problem had been fixed, as they reported back to a Delta LRR during Tuesday. This resulted in a go to proceed with the launch attempt – thus making the problem an unlikely reason for the delay. While the launch vehicle was being rolled out and erected at the pad, Mr. Musk is understood to have e-mailed the SpaceX team to postpone the launch, in order to “give the team more time to check everything” ahead of the mission. Several hours later, Mr. Musk noted the delay was due to potential commonality between the hardware on the Falcon 9 v1.1 and the F-9R Dev-1 test rocket that failed during her “hop” at SpaceX’s test facility in McGregor, Texas. While the evaluations into the test failure were also classed as the official reason behind the one day delay of the ASIASAT-6 mission – when the mission moved to Wednesday morning – sources suggest there was little to be concerned about between the test failure and the upcoming launch. It was also mooted that the launch date was expected to slip by a day, even before the F-9R Dev-1 had her issue. In explaining the details behind the problem that occurred with the F-9R Dev-1 (L2), sources stressed that any similar issue with the Falcon 9 v1.1 tasked with the ASIASAT-6 launch would not have resulted in the failure observed in Texas. 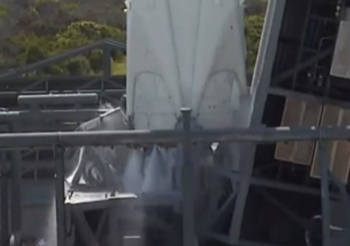 In fact, the same issue would have resulted in the Falcon 9 v1.1 aborting and safing in-situ on the launch pad – or an avoidance of the engine issue via the sensor voting system, outvoting the bad sensor. The reason the former did not happen for the F-9R Dev-1 is because she does not lift off from a regular launch pad and thus does not have the hold down posts to stop the rocket from lifting off in an off-nominal condition. Yet despite reviewing the test vehicle incident, ahead of Friday’s Static Fire – resulting a go to proceed, and again ahead of the Wednesday morning attempt, this was the reason for the delay being called. “SpaceX has decided to postpone the flight of AsiaSat 6. We are not aware of any issue with Falcon 9, nor the interfaces with the Spacecraft, but have decided to review all potential failure modes and contingencies again. We expect to complete this process in one to two weeks,” noted Mr. Musk. “The natural question is whether this is related to the test vehicle malfunction at our development facility in Texas last week. After a thorough review, we are confident that there is no direct link. Had the same blocked sensor port problem occurred with an operational Falcon 9, it would have been outvoted by several other sensors. That voting system was not present on the test vehicle. While the loss of the F-9R Dev-1 was obviously regrettable, it was not unexpected. SpaceX made it clear, over a year ago, that the test vehicle at the heart of the company’s fully reusable launch system aspirations was going to be pushed to her limits. As such, a failure was always going to be a distinct possibility. 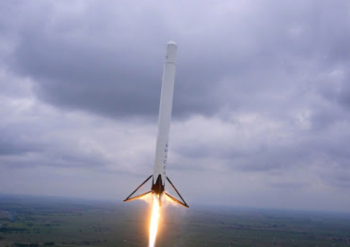 Also, in typical SpaceX fashion, the demise of the F-9R Dev-1 still provided what is understood to be a first, specifically the first U.S. autonomous Range Safety event by a rocket, as the test vehicle capably ended her own life – despite not using the more extensive version of the Flight Termination System (FTS) that Falcon 9 v1.1’s can utilize during launches out of Cape Canaveral and Vandenberg Air Force Base. Once clearance is provided to conduct the launch, the Falcon 9 v1.1 will aim to loft the ASIASAT-6 satellite into a Geostationary Transfer Orbit (GTO), utilizing the power of the upgraded Falcon 9 v1.1, with the first stage requiring all of its propellant to get the job done. As such, there won’t be a propulsive landing attempt of the core on this mission, with the next first stage return attempt currently the CRS-4/SpX-4 Dragon mission, potentially aiming for a landing on a barge in the Atlantic. ASIASAT-6 – like her sister satellite – is based on the Space Systems/Loral 1300 platform. The bird is designed to provide C-band coverage over Asia, Australasia, Central Asia and the Pacific islands. The bird also sports 28 high-powered C-band transponders, with a design life of 15 years. After being lofted into a Geostationary Transfer Orbit (GTO), she will be positioned at the 120 degrees East orbital slot, with a global beam and a regional beam to offer enhanced power and look angles for video distribution and broadband network services in the region. The launch follows on from last month’s successful mission to loft the ASIASAT-8 satellite into orbit. (Images via SpaceX, NASA KSC and ASIASAT).